Departement of the Alpes de Haute Provence. Coming from Digne, take the road through Seyne-les-Alpes (D 900) and the St-Jean pass, bringing you to St-Vincent-les-Forts. 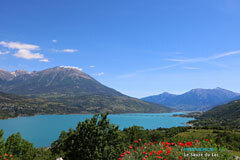 From the Haut-Verdon region, via Allos (D 902), (D 902), you will arrive at Pra-Loup. From the Alpes-Maritimes and the Mercantour via St-Etienne-de-Tinée (D 2205) and Bonette pass (2802 mètres), you will arrive at Jausiers. From Italy via the Larche pass (D 900). 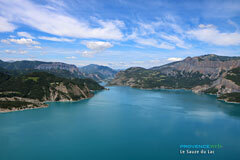 From the Hautes-Alpes via Guillestre and Vars pass (D 902), you will arrive at St-Paul. In the snow season pass through the Hautes-Alpes, from Tallard close to Gap, take the D 900 and enter the Ubaye from La Bréole. Between Maurin-Maljasset hamlet at 2,000 metres and the Serre-Ponçon lake the Ubaye is a high altitude valley, surrounded by many peaks over 3,000 metres high - the massifs of Parpaillon, Chambeyron and Séolannes - where the river Ubaye flows for 70 km. In places a turbulent torrent, it eventually joins the Durance. On its sunny right bank there are houses and farmland, while the northern left bank is the kingdom of the larch tree. Before being opened up by the construction of the D900 (in 1883), the Ubaye valley was for a long time one of the most isolated regions in France, as the mountain passes (Larche, Allos, Restefond, Cayolle...), which were snowed up for several months were the only way in and out of the valley. Communication was easier with Piedmont, which explains why the region was in the hands of the Counts of Savoy for 4 centuries (up to the 18th century). In this U-shaped Ice Age valley, hollowed out by the raging river over thousands of years, lived a true mountain people whose lives were based on the rhythm of transhumances. They were used to the hard climate, the isolation and the peddling of goods from village to village. In the nineteenth century they were prepared to become adventurers and seek exile in Louisiana and Mexico, in search of a better life. 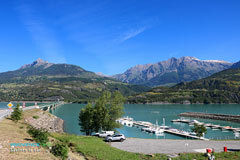 Ubaye valley really only became a tourist area in recent times with the construction of the Serre-Ponçon dam and lake in 1960. 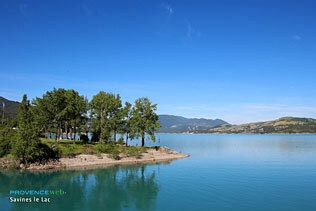 Today, it is a magnificent crescent-shaped man-made lake covering 30 km², blending superbly into the landscape. Prior to that, the Durance which receives water from the Queyras and Écrins massifs and the Ubaye valley (55% of which is during the spring thaw), had always been a curse for Provence. 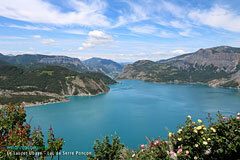 In 1955, the purpose of the construction of the titanic Serre-Ponçon dam was to curb the flow of the Durance. The dam is 120m high (made of earth with a central core in waterproof clay, a technique that is very widespread in the United States), and contains 1,271 billion cubic metres of water, making it the largest man-made lake in Europe. For those who are interested in the subject, the "Muséoscope" in Rousset retraces the dam's construction using two films and five rooms. Culture lovers will not be disappointed: they will enjoy the guided tour of Barcelonnette and of the church of Saint Nicolas de Myre at Jausiers. Several small museums will tell them about local history : at Barcelonnette (archaeology, fine arts, the story of emigration), at St Paul sur Ubaye (Tools, Work, Traditions), at Pontis (reading-writing-'rithmetic in the single room school), at Jausiers (lively, destructive, tamed water"), and Lauzet (the world of hunting and gathering). 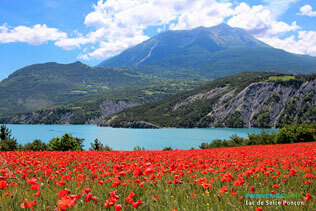 The Ubaye valley, a little-known heritage, not to be missed !. 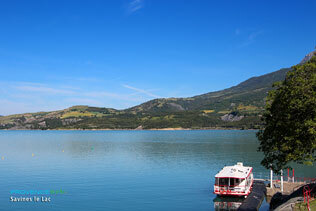 Bathing and nautical sports at Serre-Ponçon lake (a veritable "interior sea" that has obtained the "sailing resort" label). Do you like gliding ? 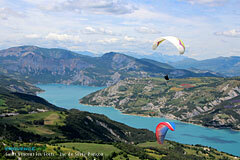 Paragliding, hang-gliding, gliding and microlighting, for example from the St-Vincent les Forts base. Do you prefer "terra firma"? 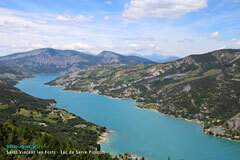 Numerous easy and more athletic hiking paths: 615 km of paths, beautiful 3000 m peaks such as Brec du Chambeyron. Climbing (La Rochette site at Savines-le-Lac, some thirty odd routes), and several Via Ferrata. Mountain biking (waymarked paths) and Bicycle touring (7 passes, including Bonette and Cayolle, to climb) and even golf or archery (at Barcelonnette. Downhill skiing at Pra-Loup or Sauze/Super-Sauze (snowboarding, Supersidecut skiing, telemark skiing, sleigh dogs), cross-country skiing at Larche and Saint-Paul-sur-Ubaye.